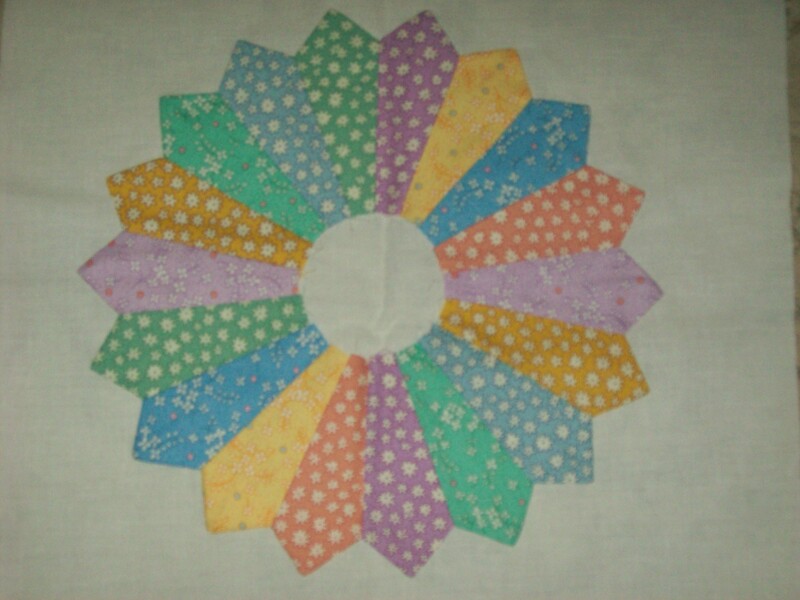 The first picture is my first dresden plate that I sewed by hand. It turned out nice and flat after ironing. It dosn't look like it because it's wrinkled from folding. 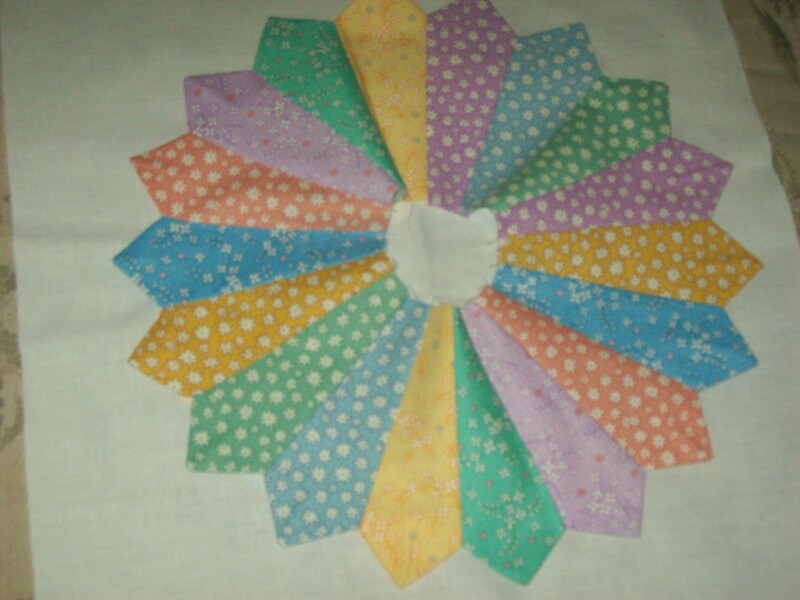 The second is one of the rest that I decided to sew on the machine. This is how they all turned out after pressing !! WHAT HAPPENED? What can I do to save them without ripping every one of them out? Is it possible the seams aren't the same? It looks like the second one has too much fabric. It is either an error in cutting, an error in the seam allowances or the actual wedges are the wrong size. You will need to figure out what it is before making more. In the second plate the green blades seem to go into a point. As Tartan said I think that the seam allowance could be the problem. check each seam and the ones that are narrow need to be re-sewn; if you cut all of your blades the same as the first one done by hand then measure your seam allowance on the hand sewn one and then check the machine ones- and re-sew to match the seam...this is a lesson concerning the accuracy of hand piecing vs. machine piecing. 9 times out of 10 the hand ones will be better...but it is fixable- you just need to do some re sewing to widen the seams that are too narrow. it may be easier to open up some of them- you will have to decide which way to go- taking apart & re-sewing or just sewing along the existing seams. Yup ... seam allowance issue. Looking at the width of each blade at the center circle I see that they do not all match on the 2nd plate. Measure them up and rip out the ones that are smaller or larger. Before you sew them back together measure the seam allowance on at least 1/2 of the seams on the hand pieced plate and get an average. Now you'll need to adjust the needle position on your machine to get the same seam allowance after ironing. Do a few test seams to make sure before you start the blades. In the picture, the second one looks like it is buckled in the center hole. Did you fold the background square in quarters, then divide the plate in quarters and flatten matching the quarter marks? Sometimes you have to gently stretch or smooth the plate outward. Measure the edge of block to plate points at quarter mark to see if it is centered, and that all blocks measure about the same at each marked point to edge. All quarter points should measure ... from the petal point to the edge of block, n/s/e/w, with no overlap of petals in center hole. (Hope my explanation is clear.) From the picture, it looks like the right side is shorter than the left side. Can't tell top r bottom as it is cut off of picture. As the others said, check your seams. Also, when you ironed you may have really ironed and not pressed. Ironing will stretch your fabric so it will grow a little. It may be a combination of both. Take some time and redo some of the seams so it is better and the center circle will hide some of it.